One of the best delicacies of Indian cuisine is ‘paan’. Served after a meal, or chewed several times a day by loyalists, a humble betel leaf transforms itself into a juicy wrap with other ingredients for company. 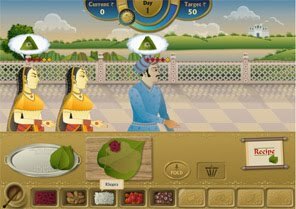 TheGameBox brings you Paan Palace, a unique game that puts you right into the shoes of royalty’s favourite paan maker! Dish out the wraps as kings and queens flock to your shop. Juggle your time throughout the day, and return satisfied customers! Play now!